Is there such a thing as a Bhutanese “national identity?” If so, how can it be defined, and how did it arise? Of related interest is the question of governance. Over the past thousand years or so, Bhutan has passed through several distinct phases of political organisation, the latest being constitutional monarchy with a democratically elected parliament. Can democracy thrive in modern-day Bhutan, in contrast to some of its South Asian neighbours where democracy has had a hard time taking hold in a meaningful sense? If so, what attributes of the people, the country, and its history account for the difference? How will democracy affect Bhutanese society? These are topics that will continue to engage the thinking of Bhutan’s leaders and the students in her colleges. For our purpose we will attempt to explore a few core ideas that emerge from the history of Bhutan that may help the discussion. In particular, there is value in studying the life of Bhutanese leaders from past eras who also made critical decisions at politically transformative moments. I would go further and argue that, in part, as a result of her unique history and geopolitical situation, Bhutan has pioneered among Himalayan countries in exploring positive adaptations for the welfare of her people. There are various approaches to examine the history of Bhutan and the concept of a Bhutanese national identity. If we adopt a strictly historical method, however, we quickly confront the fact that no formal “nation” as such existed prior to the early 17th century. But by that time, I would argue, most of the distinctive attributes of post-17th century Bhutanese culture and state behaviour were already well formed. On closer analysis, this should not be surprising. Bhutan is a fundamentally conservative nation. Until the unification process for a modern state was begun in the early 17th century by the exiled Tibetan Drukpa Buddhist hierarch, Zhabdrung Rinpoche Ngawang Namgyal (1594-1651), “Bhutan” consisted of a collection of relatively autonomous communities and remote valleys, without central organisation. Even after the 17th century unification, “central” governance was distributed through a network of regional fortress dzongs for which Bhutan is well known. Although they were constructed at the order of Zhabdrung Rinpoche as combined monastic-administrative structures, they are all located at geographical strong points where local governing entities existed during earlier centuries. Anyone who has travelled through the central districts from west to east, from Paro to Trashigang, will have experienced Bhutan’s dramatic transitions of topography, climate, and human livelihood. Before the period of modern road building in the mid 20th century, lateral travel through the country required many days, if not weeks, of effort involving pack animals and porters. Powerful glacial rivers had to be crossed. Capt. RB Pemberton’s 1838 official mission to Bhutan on behalf of British India required 24 days to reach Punakha from the Indian plains at Dewangiri (modern Samdrup Jongkhar). Indicative of the difficulties of mobility in olden times are early Bhutanese legends reciting episodes of bridge-building, the fording of rivers, and the crossing of difficult mountain passes. The dynamics of state unification grew out of, and in adaptation to, these circumstances of difficult topography and local autonomy. Equally challenging geographical barriers were presented by the Himalayas along the northern border with Tibet, and the stretch of jungly land bordering India on the south. Within these relatively protecting confines, it was possible for Bhutan to evolve a culture that was at once multifaceted and distinctive from her Himalayan neighbours. The most transformative external factor shaping early Bhutanese history was the advent of Buddhism, as both a religion and a social organising principle. Mahayana Buddhism was brought from India to Tibet during the 7th-9th century era of Tibetan monarchy, and from there to Bhutan. Fortunately, Himalayan Buddhists were highly literate. Where Buddhism spread, education became a priority. Our entire pre-17th century written knowledge base about Bhutan comes from Buddhist historical and monastic biographical sources. The prominence of Tibet’s role in the spread of Buddhism explains to a large degree why the earliest sources relating to Bhutan were written by Tibetans. In the absence of written records from Bhutan predating the 15th century, we are dependent on the writings of Tibetan monks who visited Bhutan as part of their religious obligation to spread Buddhist teachings into far-flung regions. These sources reveal an evolving panorama of Tibetan attitudes towards Bhutan spanning some 13 centuries. In the beginning, as we read documents reflecting the viewpoint of the early monarchy, Tibetans viewed the “southern lands” or Lhoyul in quasi-mythic terms. It was both a geographical and a cultural frontier, inhabited by people generally lumped under the ethnic term Monpa. The Monpa people, or people occupying a vaguely identified Monyul (Land of the Mon), as so interpreted in the Tibetan myth, were presented as primitive and spiritually unenlightened, i.e. people among whom Buddhism had not yet spread. The area now known as Bhutan was part of this southern expanse that reached as far west as Ladakh. The story of how Buddhism spread and flourished within the Himalayan southlands occupies some 800 years of pre-17th century Bhutanese historiography. The key early event was the founding of small temples in the Paro and Bumthang valleys, by Tibetan monarchs staking out the southern limit of their presumptive realm, or, as the Bhutanese interpret them, as temples dedicated to the spread of Buddhism, i.e. discounting the imperial element. The restoration of these temples several times in later centuries presented opportunities for cooperation between leaders of Tibet and Bhutan. But the powerful Tibetan monarchy disintegrated in the mid 9th century through internal conflict between those members of the Tibetan court who supported Buddhism and those who supported the native Tibetan religion called Bon. The imperial breakup profoundly affected the future of Bhutan. Starting from the dying decades of the monarchy, as recorded by Nyangral and other monk historians of the 12th century and later, there arose an inspiration among some of the adherents of Buddhism to “take refuge in the south”, to hide Buddhist texts and royal documents for their safe-keeping in places deep within the Himalayas. At least two Tibetan princes of the royal dynasty are said to have gone into exile in Bhutan. Romanticised interpretations of their lives made their way into the lore of both countries. Bhutan, and other segments of the Mon Southlands (Lho Mon) came in this way to be seen no longer as barbarous fringe lands, but rather as repositories for the safe-keeping of the Buddhist texts and traditions that were endangered in Tibet. The 8th century Indian saint Padma Sambhava is said to have ventured from Nepal and Tibet into the Bhutanese valleys where he also hid Tantric Buddhist teachings and acquired disciples. His descendants established themselves in Bhutan’s central valleys. The vast literature inspired by his life contains vivid descriptions of the “hidden valleys” of Bhutan as places where Buddhism could be protected from the political dangers in Tibet. The influx of Mongols to Tibet during the 13th century further amplified the perception among some that, as foretold in ancient prophecies, the time had come for men of religion to take refuge in Bhutan. 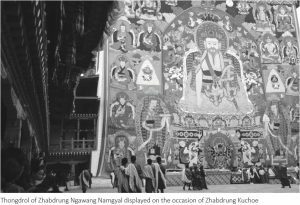 Whether factual or legendary, such ideas shaped Tibetan perceptions of Bhutan and foreshadowed events leading up to its emergence as an independent country, and to the founding of state rituals such as Tshechu that are so revered in Bhutan today. During the 12th-15th centuries, Tibetan monks travelled to Bhutan and elsewhere along the Himalayas either on teaching missions or as pioneers in search of the hidden spiritual teachings of legend. In some cases they were invited by local valley chieftains or Bhutanese students attending monasteries in Tibet. In Bhutan they often built small family-held monasteries quite unlike the large monastic centres that characterised central Tibet. Many leading families of later centuries, who adopted the title Choeje (Dharma Master) to mark their heritage, traced their ancestry to one or more of these missionary monks. A well-researched book by the late Bhutanese scholar Lam Sangngak called the Nyoerab (Dz. Smyos rabs) describes the histories of many such families from Ura and eastern Bhutan. In western Bhutan, the leading families were patrons of different branches of the Drukpa sect. The most prominent were devotees of a Tibetan monk named Phajo Drukgom Zhigpo (1184?-1251?) who assembled and bequeathed to his four sons a Buddhist ministate spanning the Paro-Punakha region of western Bhutan. An old name for Bhutan, Lhomon Khazhi (The Mon Southlands of Four Doors) seems to have first applied to the territory under their control. Another legacy of Phajo was an enduring connection between his patrons and their offspring from western Bhutan and the Drukpa home monastery of Ralung in central Tibet. Ties between the hierarchs of Ralung and the descendants of Phajo were solidified through marriage. Many of the best known monasteries in western Bhutan were founded by hierarchs of Ralung in service to the local population. Other prominent families were descendants of notable Tibetan exiles. Stemming from the troubled times of post-imperial Tibet, numerous families from Eastern Bhutan, including the present-day Bhutanese royal family, claim to be descendants of Prince Tsangma of the Tibetan imperial family. Later examples of famous exiles include the “crazy” saint Drukpa Kuenley (1455 – 1529) who famously left Tibet for Bhutan after his family became embroiled in a local political feud. By far the most important Tibetan exile into Bhutan was Zhabdrung Rinpoche Ngawang Namgyal (1594-1651), founder of the modern state. The story of his life and the political forces that drove him from Tibet in 1616 have been described in several studies. At the basis of the event was a controversy over the limits of sectarian versus lay authority among the elite ruling institutions in Tibet. The integration of political and spiritual governance called “chosi zungdrel” that Zhabdrung Rinpoche brought to Bhutan was a system with deep roots, first manifested at the national level in Tibet when the Sakya religious state was founded during the mid 13th century under Mongol patronage. During the subsequent 400 years, the concentration of political and financial power made possible by such a linkage led to its widespread adoption in various forms among the competing sectarian establishments and their lay supporters, including the Drukpa school centred at Ralung and Druk monasteries. A further complicating factor during these same centuries was the emergence of the institution of reincarnate Lamas, or Tulku, taking a supreme role. Could, or should, such a spiritual incarnate be vested with not only religious but also civil authority? When such a Tulku passed away, how could the process of recognising his reincarnate successor be managed free of political interference? Who would control the substantial patrimony of his estates and monasteries? All of these questions came into play in 1616 when the then supreme ruler of central Tibet, the king of the Tsang province (in which Ralung was located) sided with powerful rivals of the Zhabdrung to deny his status as the sole legitimate reincarnation of the revered Drukpa Tulku Pema Karpo (1527-1592). His decision, had it been accepted, would have also disenfranchised the Zhabdrung’s family which had ruled Ralung since its founding in the 12th century. A lesser monk might have acquiesced in the face of such a judgment. But Zhabdrung Rinpoche was both shrewd and possessed of an assertive nature. In 1616, he left Tibet for Bhutan in the company of Bhutanese students at Ralung who guided him safely through treacherous Himalayan passes into the Thimphu valley, where he took up residence at Tango and Cheri monasteries. His temporary exile became permanent when, some nine years later, he decided to reside permanently in Bhutan and form a new state based on the Drukpa sectarian version of chosi zungdrel. The learned Tibetan scholar Samten Karmay has written somewhat controversially that the head of state in Tibet was never meant to be a Tulku or reincarnate Lama, that it was an accident of history when the 5th Dalai Lama began the system in 1642 when he was ushered in as Tibet’s leader by his Mongol patrons. A somewhat different situation existed in the case of Zhabdrung Rinpoche. The Zhabdrung basically installed himself as the head of the new government in Bhutan, during the 11th Bhutanese month of a Wood Ox year corresponding to November-December 1625. He staked his claim on an array of prophecies and revelations, and he insisted throughout that, although in exile in Bhutan, he remained the legitimate heir to the ruling patrimony of Ralung. His drawn-out fight with Tibetan authorities came to a head in 1644, two years after the Gelug sect had defeated the Tsang king, when the newly installed 5th Dalai Lama launched an army against Bhutan. But, famously in Bhutanese history, the Tibetans were defeated, at Drugyal Dzong and elsewhere. In revenge, the Tibetan government seized control of Ralung and Druk monasteries in Tibet and handed them over to the Zhabdrung’s rival Tibetan claimant. The rift between what thereafter became “northern” and “southern” divisions of the Drukpa sect lasted until a tentative reconciliation during the mid 18th century, and was finally resolved only in 2009 when HH the Gyalwang Drukpa Rinpoche convened the first annual Drukpa Council at his monastery in Kathmandu. It is commonly, but inaccurately, written that Zhabdrung Rinpoche was merely the spiritual ruler of Bhutan, and that civil authority was vested in the office of Druk Desi or civil administrator. In fact, the political setup envisioned by the Zhabdrung was one where both spiritual and civil authority were vested in himself and his male descendants, who were to be conceived prior to his lineal successors having taken their final monastic vows. The first Druk Desi was appointed by the Zhabdrung himself as a subordinate officer of state, which the Desi acknowledged in a public meeting. This meant that ultimate authority remained with the Zhabdrung. But the system foundered from the beginning because the Zhabdrung went into meditative retreat (and probably died) in 1651, while his only son suffered from a debility that rendered him unsuited to succeed to the throne. This left Bhutan, still very much at war with Tibet, without a viable system of ruling succession. The Zhabdrung supposedly remained in deep retreat, and it was not until 1705 that his death was finally revealed and the alternatative system of supreme Zhabdrung reincarnate rulers was adopted. But by then three more Desi had come into office, on the basis of apparently convincing evidence that the Zhabdrung himself had authorised their appointments during his retreat. After the passage of nearly 50 years, however, the civil administrators apparently no longer felt a strong obligation to submit to the authority of a child reincarnation of the Zhabdrung Rinpoche, or of his now deceased son Jampal Dorje or his nephew Tenzin Rabgye. The struggle for theoretical governing supremacy between the institution of the reincarnate Zhabdrung Rinpoche and the Druk Desi resulted in long periods of political instability in Bhutan which persisted until the Bhutanese monarchy was established in 1907. The third ranking officer of state, the Je Khenpo or Abbot of the state monasteries, often tried to mediate between the feuding parties, but his power was limited. A series of British emissaries to Bhutan during the 18th-19th centuries witnessed these disputes. In 1774, George Bogle met with and reported on the frustration of the then supreme reincarnation and rightful ruler, Jigme Sengge, whose authority the Desi would not acknowledge. As in Tibet, the system of reincarnate heads of state was unstable and subject to difficulties and abuses. In very few instances did any of the supreme reincarnations come of age possessed of the leadership and political skills needed to run the country. On the contrary, the temptation to sponsor a child as a candidate reincarnation opened a pathway to power for many ambitious men who hoped to thereby get themselves appointed as the Desi. The argument was made that there were simultaneous “speech” and “mind” Zhabdrung reincarnations, perhaps to satisfy these conflicting agendas. In addition, several of the reincarnations prior to 1907 were discovered as the offspring of families in Tibet. Of course, the Tibetan government exploited such events to wring concessions from Bhutan. The assertion by the Manchu emperors of firm administrative control over Tibet during the 18th century dramatically affected the relationship between Tibet and her Himalayan neighbours. For Bhutan, the reality of Manchu imperial power became starkly clear in the outcome of a civil war between political factions in Paro and Thimphu. When the belligerent party from Paro appealed for support from Tibet, the Tibetan civil ruler Pholhane (1689-1747) exploited this chance to once again assert Tibetan influence in the affairs of Bhutan. Tibet invaded Bhutan, villages were sacked, and dzongs were assaulted. In the outcome the Bhutanese combatants were forced to reach a mutual accommodation. The situation was at first uncomfortable for Bhutan. Delegates from the warring factions had to be sent to Beijing to placate the emperor. The Chinese text of their petitions has been preserved. These events were arguably the first significant challenge to traditionally isolationist Bhutan since the era of the Zhabdrung Rinpoche. But in the aftermath, there emerged several Bhutanese leaders who seized the opportunity to significantly change the tone and substance of Bhutan’s traditional approach to transnational politics. They rose to the occasion and crafted a more proactive and politically pragmatic foreign policy, and, in our view, created a precedent for dealing with Bhutan’s neighbouring countries that was ultimately to be successfully emulated by the Wangchuck monarchs during the early 20th century. The 10th Desi Mipham Wangpo (1709-1738) was one of the key players. He was also a reincarnation of Zhabdrung Rinpoche’s nephew Tenzin Rabgye. Against the wishes of other Bhutanese men of power, Mipham Wangpo went to Lhasa on a peace-making trip in early 1736. There he met the Tibetan ruler Pholhane and other high officials. Further visits to Tibet by important Bhutanese monks and officials were arranged in order to solidify a closer association between the two countries. A few Bhutanese monks even enrolled in Gelug monasteries in Lhasa where they received the Geshe degree from the 7th Dalai Lama. Temples were cooperatively restored in both countries as publicly visible symbols of this new accord. A second important Bhutanese ruler critical to the reconciliation effort with Tibet was the 13th Desi Sherab Wangchuck (r. 1744-1763). Like so many Bhutanese leaders of history, his career began from humble origins and years of study as a monk. But his talent and honesty were recognised during the difficult events of the mid 18th century, and he was recruited to serve as Paro Penlop, i.e. governor of Paro Dzong. From there he rose to the position of Desi. Following Pholhane’s death in 1747, mortal competition to succeed him as civil ruler of Tibet broke out between his two sons. This was a potentially dangerous moment. The Manchu Qianlong emperor was closely managing Tibetan affairs during these years. A wrong move by Bhutan could have been disastrous. But Sherab Wangchuck correctly saw the situation as an opportunity to assert Bhutan’s stature on the Himalayan political stage. In 1749 he sent a mission to Lhasa with gifts for the contending parties. The Penlop of Dagana Dzong was sent as a diplomat to help mediate the dispute. But, by 1751, one of Pholhane’s sons had assassinated his brother who in turn was killed by the Chinese officials stationed in Lhasa. Immediately after these events, the Qianlong emperor ordered that the 7th Dalai Lama be installed on the throne, returning Tibetan rule once again to a Dalai Lama. The Bhutanese had already cultivated good relationships with the 7th Dalai Lama. Like Sherab Wangchuck he was politically astute, a highly intelligent patriot, and advocate of Tibetan traditionalism. In subsequent years the two men joined together on a set of actions to further improve the relationship between Tibet and Bhutan. In 1751, Sherab Wangchuck adopted the role of peacemaker in Tibet once more, this time during the course of a civil war in Ladakh where Bhutan had long-standing political and religious interests. Sherab Wangchuck dispatched as envoy Sonam Lhundrup, the governor of Wangdiphodang Dzong. Again, presents were sent for the contending factions and a satisfactory peace was established, although it seems that a Tibetan mediator, a Lama of the Nyingmapa sect, played the primary role. It is the character of Bhutan’s initiatives at this juncture of history, rather than the precise consequence of her efforts, that is worth noting. The novelty of a Bhutanese ruler attempting to mediate in the difficult politics of Tibet must be viewed as a remarkable turn of events. It would have been unimaginable during the era of Zhabdrung Rinpoche. Sherab Wangchuck’s efforts to promote the image of an independent and responsible Bhutan were thus successful to a considerable degree. The country’s limited resources did not permit it to assume a major role in Himalayan affairs. But isolation from Tibet was an anachronistic policy to which return was impossible. It was to Sherab Wangchuck’s credit that his leadership and outwardlooking diplomacy achieved as much as it did. His deployment of minor district governors to lead diplomatic missions was, in our interpretation, an attempt to train and expose them to a broader horizon of political possibility than what they would experience in their otherwise limited domains in Bhutan. The writing of history was also promoted by this Desi. The first national history of Bhutan, the Lho Choejung, was written by the 10th Je Khenpo under his auspices, and early prints were sent as gifts to the Drukpa Lamas of Tibet. During the late 18th century, the British East India Company expanded its control over lands just below Bhutan, first in Bengal and then along the entire frontier following the annexation of Assam from Burma in 1826. A small border war with Bhutan in 1773 over mistreatment of a British subject prince by local Bhutanese officials abrupty introduced a new player, British India, into the sphere of Himalayan affairs. The treaty imposed on Bhutan by the Company covered the management of agricultural estates and mutual treatment of each country’s citizens living along the frontier. A minor penalty was assessed against the Bhutanese, coupled with the opportunity to conduct trade with India at a traditional frontier mart called Rangpur. These British were merchants, not yet the rulers of a colonial empire or possessed of the imperial zeal that would energise their successors a century later. 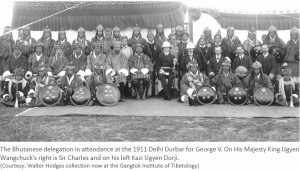 They were genuinely interested in cultivating relations with “native rulers” who might help them develop trade relations with Tibet. Could Bhutan play such a role? This was a question that their emissary to Tibet, George Bogle, sought to explore during his mission through Thimphu to Tashilhunpo in May, 1774. The British East India Company’s focus on orderly control of its commercial interests meant that the hitherto loosely managed southern districts of Bhutan would become an ever growing problem for the central Bhutan government. They were the source of agricultural revenues, but the local agriculturalists were ethnically Indic, non-Buddhist, and spoke local languages. Appearing in a prophetic vision before a highly respected Je Khenpo during these years of turmoil, the deceased Zhabdrung Rinpoche admonished him that the troubles then afflicting Bhutan were due to a decline in the purity of religious practice. He warned against treaties or alliances with foreign governments, particularly the British. In the dream, the Zhabdrung Rinpoche also astutely cautioned that unless his advice was followed Bhutan would become a sparring ground between China and India. Conservative attitudes such as this must have contributed to Bhutan’s inability to reach a comfortable modus vivendi with British India. In the absence of far-sighted civil leaders during the decades after Desi Sherab Wangchuck, the inherent weakness of the Zhabdrung system contributed to a growing breakdown of the structures of central governance, even though the very source of any ruler’s authority depended on it. Factions in the western valleys fought over the positions of power and control of the dzongs, ignoring the need to better manage the southern agricultural tracts on which state revenue depended. This led to several episodes of territorial confiscation by the British of Bhutan’s southern districts. The so-called Duar War of 1865-1866 finally resulted in Bhutan’s loss to the British of all the lands bordering Sikkim, thereafter called “British Bhutan”, and the entire set of agricultural lands along the south. In compensation, the British paid a miserly annual subsidy under terms and conditions that placed a difficult burden on Bhutan. After 1757, the British began the practice of establishing “Residencies” within the capital grounds of many princely states of India with whom they negotiated treaty relations. A Resident political officer was assigned to conduct diplomacy, but also to “advise” a native prince on the management of his state. Unlike nearby Sikkim and Nepal, and more distant Kashmir, however, Bhutan never consented to the establishment of a resident political officer as proposed by British emissaries beginning with George Bogle in 1774. By the 1860s, at the nadir of their relationship, conservative Bhutan must have perceived how such institutions had been used to undermine the authority of other native Indian princes, including the Chogyal of Sikkim. Foreign relations were still energised by isolationist sentiments in Bhutan, even as the British were approaching the peak of their imperial ambitions in Asia. By the late 19th century, the British viceroys of India were preoccupied with gaining access to Tibet, not just for trade but, more urgently, to forestall an imagined counterforce from Czarist Russia. Their first attempt to establish a trade mission at Yatung or Phari in lower Tibet, as authorised by the Chefoo Convention signed with China in 1876 was rebuffed in 1886 by Tibetan authorities in Lhasa who would neither honour the treaty nor acknowedge China’s right to speak on their behalf. Frustrated by the apparent impotence of Tibet’s supposed masters in Beijing, the British were determined to negotiate directly with Tibetan authorities in Lhasa. Macauley’s mission of 1886 having failed, the question was how to make a successful approach. To contact the authorities in Lhasa the ambitious new Viceroy of India, Lord Curzon (r. 1898-1905), recognised the need for a “native” go-between, someone who understood the ways of commerce and who could move easily between the cultures of Tibet, India, and Bhutan. Once again, the question arose: could Bhutan play a useful role as intermediary? The man they chose was Ugyen Dorji (1855-1916). Ugyen Dorji was the most notable Bhutanese private trader during the late 19th century, a native of Paro who conducted his affairs from a base near Kalimpong, West Bengal, along the ancient trade route from India to Tibet. This district had been part of Bhutan until it was ceded to the British after the Duar War. Ugyen Dorji followed in the footsteps of his father whom he assisted in conducting trans-Himalayan trade from what would later become known as “Bhutan House” near Kalimpong. There, he became acquainted with John Claude White, appointed in 1889 to serve as the first British Resident in Sikkim. Ugyen Dorji had already assisted AW Paul of the Indian Civil Service in organising the newly annexed British Bhutan. JC White and Ugyen Dorji developed a relationship of trust and friendship that would become one of the keys to unsticking the lingering misunderstandings between the two countries. Already during the Macauley episode of 1886 the British had made use of Ugyen Dorji’s contacts in Lhasa. During the years 1898-1902, Ugyen Dorji was recommended to Lord Curzon to serve as a go-between, conveying letters to the Dalai Lama. When this channel of communication failed to bear positive results, however, the British chose to basically storm the gates of Tibet by launching the infamous Younghusband expedition of 1904-1905. During the last decade of the 19th century and the first decade of the 20th, Ugyen Dorji, like his father, had come to see the power of the British and the strategic importance to Bhutan of playing the role of friendly intermediary between Tibet and British India. Ugyen Dorji in particular understood the personalities, the languages, and the politics of the different parties. In 1897 the British rewarded his efforts with the grant of the ad hoc title Bhutan Agent. In 1900 the Bhutanese leaders awarded him a position of Kutshab or representative of Bhutan to manage the southern properties. He worked for both sides and was trusted by both. During these same challenging years, there emerged in central Bhutan a capable new leader, Jigme Namgyal, father of Bhutan’s first king HM Gongsa Ugyen Wangchuck (1862-1926). The story has been told elsewhere of how he managed from his position of Trongsa Penlop to wrest control of the position of Desi and, for the first time since the era of Zhabdrung Rinpoche and his nephew Tenzin Rabgye, to control all of Bhutan. The fortress of Trongsa was the traditional stronghold from which the western Bhutanese had administered the central and eastern parts of the country. Jigme Namgyal’s heritage was from the east, and he was also a descendant of Bhutan’s revered Nyingmapa saint Pema Lingpa. He thus combined within himself the key attributes of a national leader for a Bhutan that was still emerging from its ancient ways. Ugyen Dorji and Ugyen Wangchuck were not only cousins, but men of compatible talents and vision. Recognising the strength of British power in a way that Tibetans did not, they collaborated in the decision to support the British at the time of the Younghusband Expedition, to the extent of offering Bhutan’s services as mediator and refusing to provide military support to Tibet. For these contributions the British sent a delegation after the war to Punakha. There they awarded Ugyen Wangchuck the medal and honour of being a Knight Commander of the Indian Empire (KCIE), and to Ugyen Dorji the honorary title “Raja”. In 1903 the British invited Sir Ugyen Wangchuck and Raja Ugyen Dorji to attend the royal durbar in Calcutta for the Prince of Wales, soon to become Edward VII. There for the first time they were introduced to the highest British officials, and distinguished themselves in this society that was so new to them. In 1907, at the urging of Raja Ugyen Dorji, the collected leadership council of Bhutan decided to install Ugyen Wangchuck as the first King of a united Bhutan. (The most detailed source on these events is the history of Bhutan written in 1994 by the late esteemed Bhutanese scholar Lopen Pema, now also available in English translation by Jagar Dorji, and the recent monograph by Tshering Tashi on Gongzim Ugyen Wangchuck). From a nearly pristine, medieval state in 1907 until the 1960s Bhutan progressed along a slow but steady trajectory of modernisation. As late as 1958, Indian Prime Minister Nehru could report on return from a visit to Bhutan that although he saw a world of well-off peasant farmers, it was nevertheless one “with no roads, no vehicles, no automobiles, no modern gadgets, no unemployment, and no beggars”. Even so, initiatives in public education, public health, transportation and governance were being carefully considered and implemented by Bhutan’s leaders, although in characteristic Bhutanese fashion outside the limelight. The Wangchuck monarchs inherited the traditional Bhutanese sense of caution. They recognised the existential challenges faced by a small state sandwiched between larger neighbours India and Tibet. Little had changed in that regard since Zhabdrung Rinpoche’s dream admonition to a Je Khenpo two centuries earlier. However, the Sino-Indian war that broke out in 1962 injected a sense of urgency in all of these areas. Within a decade the pace of change was ramped up, and as one sign of that change, by 1974 a tourist industry was being established. What is noteworthy in our final analysis is the fact that, whereas over many centuries the existential challenges to Bhutan have not much changed, Bhutan’s responses to those challenges have always been most successful when they were formulated by proactive, outward-looking leaders, men open to learning and adaptation. Over the centuries, Bhutan’s leaders have learned from their core traditions, from their neighbours and, in Buddhist fashion, they have also learned from their adversaries. They have adopted practices from outside that seemed beneficial while rejecting others. The new Bhutanese constitution, for example, embodies principles that are both Bhutanese and foreign. The process of creative adaptation continues today.